(Nanowerk Spotlight) Freshwater could become the oil of the 21st century – scarce, expensive and fought over. While over 70 per cent of the Earth's surface is covered by water, most of it is unusable for human consumption. Technological advances have made desalination and demineralization feasible – albeit expensive – solutions for increasing the world's supply of freshwater. However, nanotechnology-based water purification devices have the potential to transform the field of desalination (read more: "Nanotechnology and water treatment"). Researchers have now demonstrated a new, efficient and fouling-free desalination process based on the ion concentration polarization (ICP) phenomenon – a fundamental electrochemical transport phenomenon that occurs when an ion current is passed through ion-selective membranes – for direct desalination of sea water. "Our work brings to the field of desalination a novel mechanism for removing salts, which is different from more conventional reverse osmosis or electrodialysis," Jongyoon Han tells Nanowerk. "This new mechanism removes not only salts but also any charged colloids in the source water, such as cells or bacteria, thereby fundamentally eliminating the potential for membrane fouling and clogging. This can significantly reduce the complexity and cost of direct seawater desalination." Han, an associate professor of Biological Engineering at MIT, explains that this new process has several unique and attractive features for water desalination applications: "It has a power efficiency that more or less matches that of current state-of-the-art reverse osmosis plants. In a single-step operation, 99% of the salt contained in the sea water is removed, with 50% of the incoming sea water being recouped as desalted water." 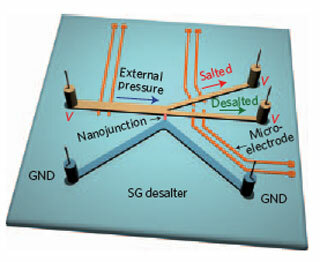 Reporting their findings in the March 21, 2010 online issue of Nature Nanotechnology ("Direct seawater desalination by ion concentration polarization"), Han's team has demonstrated that an ion concentration polarization zone (ion depletion zone) generated in a microfluidic channel can be used to remove salts from seawater in an energy efficient manner. Han recounts that the idea for the desalination application arose when the researchers studied the science of ion concentration polarization, a phenomenon observed in perm-selective (ion-selective) membranes such as Nafion. "Often called ion depletion or enrichment, this phenomenon arises owing to the mismatch of charge carriers at the membrane interface," he explains. "The membrane (either nanochannel or nanoporous membrane) preferentially conducts only cations that do not match the ion conductivities in the bulk electrolyte. As a result, ion concentration gradients are generated on both sides of the membrane. Once ICP is triggered near the cation exchange membrane, the concentrations of both cations and anions decrease on the anodic side of the junction (ion depletion) and increase on the cathodic side (ion enrichment). Furthermore, any charged particles, cells and other small colloids will be similarly depleted or enriched." Combining this phenomenon with an external pressure-driven flow, it is possible to achieve a well-defined steady-state depletion zone in a micro/nanofluidic desalination system. Han points out that the present mechanism cannot be applied to the removal of neutral organic compounds. So, to obtain truly drinkable water, conventional methods for removing neutral compounds, such as charcoal absorption, should be used in combination with this method. "While additional engineering work needs to be done, we think this method eventually can be made into a small scale, portable desalination system," says Han. "Current desalination technology can be quite efficient as well, but only at a large, plant scale operation. Resource-limited areas or disaster-striken areas that are suffering from the shortage of water often do not have necessary desalination plant and electricity / water delivery infrastructure. In those places, and for diverse humanitarian / military applications, such a small scale, portable system could make a difference." The team's next target is to build a scaled-up version of the current unit device. 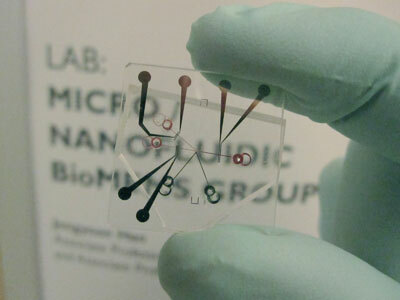 Instead of making the same device larger, they will duplicate the unit microfluidic device on a wafer scale in order to reach meaningful flow rate (~100mL/min).